Ever since writing The Fuel and the Engine, I’ve wanted to help people map out their own process and learn about other potential tools to improve it. I built the UX Tool Belt to solve both. With the UX Tool Belt, you can learn more about the many techniques UX professionals use from initial research and planning to design to usability testing. You can select the tools that fit your process (whether for a specific project or overall). You can even create a rudimentary estimate of time and cost, with explanations of what each activity entails. Expand your skills by learning about new tools and techniques in more depth. Where do you start? Where do you end? What tools do you use along the way? Give each tool a rough estimate of time and cost for yourself, your team, or your clients. Notice a weird bug? 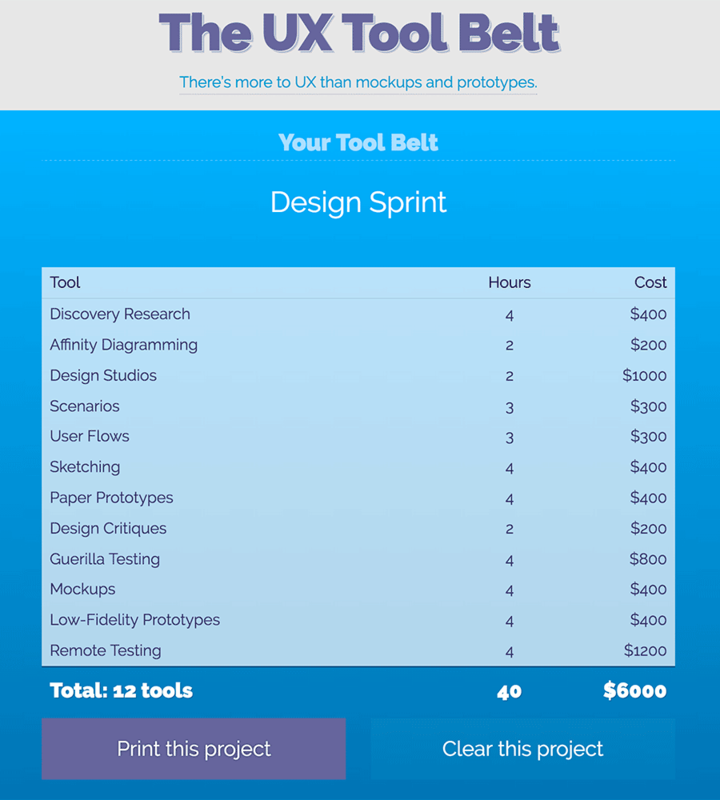 Got an idea to make the UX Tool Belt even better? Whatever it is, let me know and I'll take it into consideration. Thanks so much!